No Justice! No PEACE! for the Christians in Lahore,Pakistan | the "silent" majority no more! EXPOSED! Anti-Christian pogrom by Muslim SAVAGES in Lahore, Pakistan. On March 9, 2013, The Joseph Colony, a modest Christian Community, was destroyed by 3,000 marauding Muslim SAVAGES! The devastation was overwhelming. Over 100, possibly 200, homes destroyed, burned to the ground. Also their Bibles, crosses and churches. Incinerated. Gone. Accused of blasphemy. Punished for being Christians. This is how peace loving Muslims are treating Christians in Pakistan. It’s time to wake up and to raise our voice for their rights, to help eliminate Christian persecution. I learned of this horrific crime when I received an important video from associate, Jonathan C. He sent a link to a video shot a few days ago by a Christian girl in Lahore, Pakistan. A Christian he knows through face book. She filmed this with a borrowed (and hidden) cell-phone. Fifteen days after the attack, the Christians of The Joseph Colony were still living in squalor on the streets. And the police were no longer welcoming cameras that might expose this shameful treatment of their citizens by the Punjab Government. Something the government of Pakistan wants to keep hidden. Yet, one individual, a Christian girl, has dared to expose this unending devastation. And the WORLD would be kept ignorant of this horrific crime but for her bravery. She shot this video, followed by the police the whole way, so she could show the deplorable conditions the Christians of Joseph Colony are forced to live in; camped out in tents on the street surrounded by garbage, with no hope of recovery. No one is helping them! The government did send some checks, 265 checks ($5000 each) but only to those who were a member of the government’s political party. Robert Spencer (Jihad Watch) observes that it is not surprising the checks bounced, as those considered infidels are not entitled to monetary compensation by Muslims. Rather, it is the other way around. Of course Spencer is referring to the “jizya” — a poll tax Islamic leaders demand of their non-Muslim subjects. The government arrested some Muslims for the violence, but now other Muslims are threatening to attack Joseph Colony (again) if the government doesn’t let the arrested Muslims go. Will the Pakistani government be able to save them from another attack? Will they even try? In her video, this Christian girl, shows how these people are living on the sidewalks off the main street, in tents, and she talks to a man who lost everything. He tells, from his perspective, how the attack got started. When the government told people to come in and show paperwork proving what they had lost, this man gave them the paper work for his lathe machine (for which he had saved for 30 years) they took the piece of paper and tore it up right in front of him. Jonathan asks that we please pray for these people. They are quite desperate right now. And if you’d like to help in any way, just contact him through you tube. What follows is her video. Please, share this video. Let everyone see what’s really going on in Lahore, Pakistan where there is NO JUSTICE for The Joseph Colony and, if the attacks continue, NO PEACE. The unfortunate incident of Joseph Colony wherein over 100 Christian homes, shops and stores were vandalised and burnt by an unruly crowd after an individual was accused of committing blasphemy, reflected the extent of religious intolerances in our society. The incident has brought collective dishonor and shame to the nation, which already reels under violent episodes occurring from incidents of religious intolerances. The Punjab Police admitted before the Supreme Court on a suo moto notice that the concerned station house officer of the police registered the blasphemy case against the accused Christian man as he succumbed to the pressure of a building crowd around the police station. The complainant did not even mention any derogatory remark in his application that could be construed as a blasphemy committed against the person of Holy Prophet Mohammad (SAW). Senate Standing Committee on Human Rights Chairman, Afrasiab Khattak, has said the constitution ensured equal rights to people of different religions.Talking to the journalists during his visit to Joseph Colony, Badami Bagh, on Friday, he said that all people were equal before the law and Islam gave a message of peace, tolerance and patience. He said he condemned such incidents that disrupted peace in the society. Punjab Chief Minister Shahbaz Sharif had announced Rs0.5 million in compensation for each of those affected in the mob attack. However, the 265 cheques distributed by the government have bounced. On March 9, an over 3,000-strong mob had set ablaze more than 150 houses of Christians in the Joseph Colony over alleged blasphemous remarks against Prophet Muhammad (pbuh) by Sawan Masih, a 28-year-old Christian sanitation worker. Muslims brunt down more than 150 Christian’s Houses, no dead body BUT, every thing is badly burned. Dozens Bibles, three Churches,Dowry of girls, Valuable property and animals were burned alive. Dozens of inhabited houses, three thousand peoples including infants, school going children, woman’s affected. 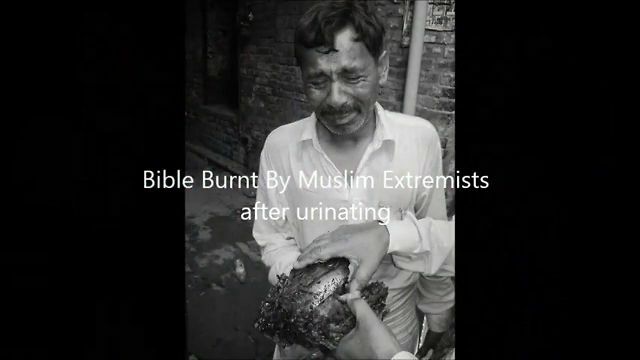 Extremist Did Urine on Bibles than burn the Bibles! Pakistani Media is not showing burnt Bibles on TV Channels even they don’t want to talk about it! 2:16 One woman could not find her daughter. (we can guess what that may mean). “They’ve burnt EVERYTHING! Emptied safes and purses of this modest community. Robbed. I have nothing left nothing for my children. My grandchildren. I am FINISHED. Samuel is a mother to a four-month-old daughter – a normal, contributing member to society. Yet, now she feels like a second-class citizen. It is a CRIME in The MUSLIM WORLD….